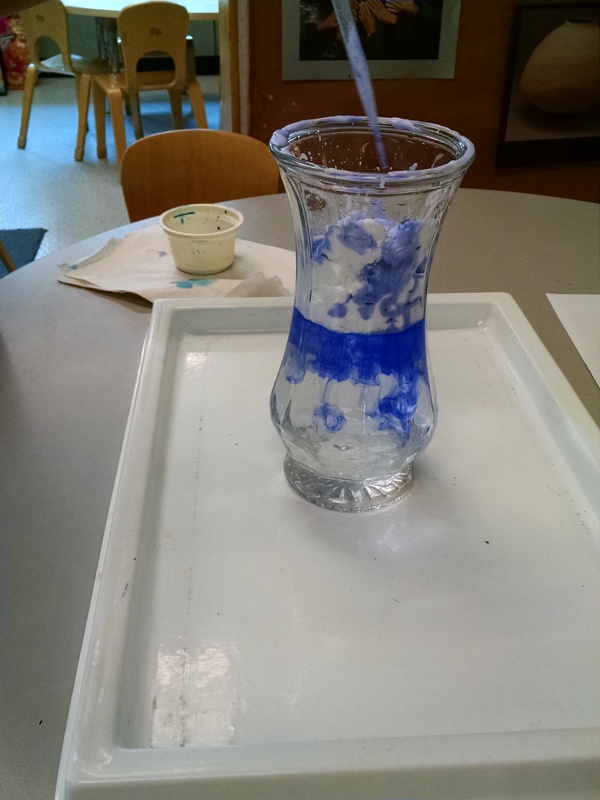 At this week’s Family Inventors Lab, our theme was Rainbows and Color Mixing. 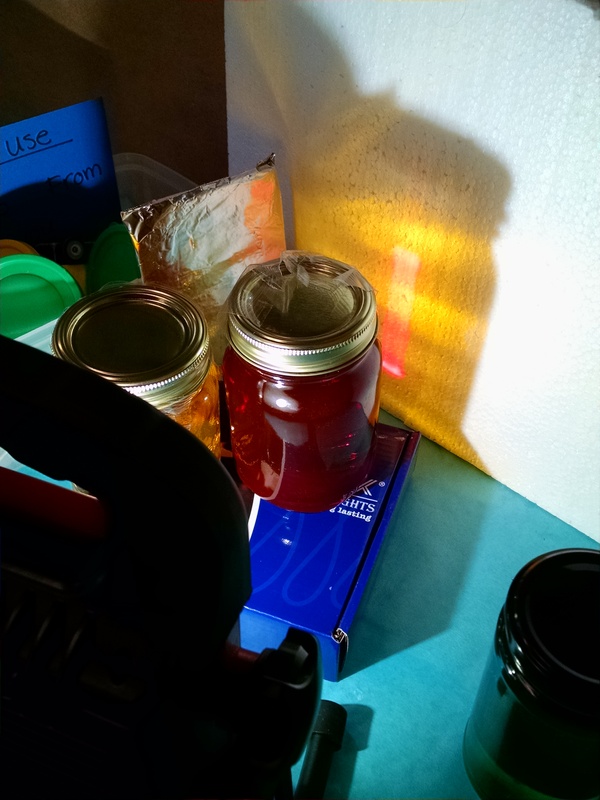 This followed last week’s session on Light and Shadow and we were able to reflect back on what we learned there about light reflection and refraction, and extend it here. 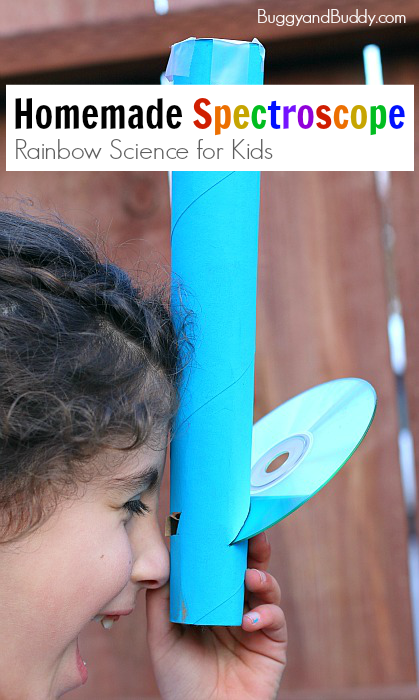 Science Tools – Build a spectroscope. 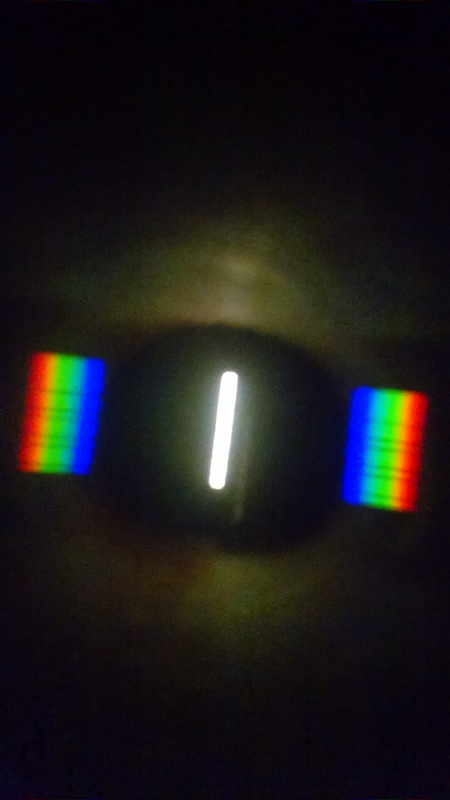 This year, we used Rainbow-Scope Kits. You can read all about them in my review of Rainbow-Scopes. It was a fun, do-able project for all our kids, with nice results. We also put out kaleidoscopes, our spectroscopes, and prism viewers for them to look through. We had crayons / markers and paper out so the kids could draw what they saw. It might also be fun to give kids a camera and let them take pictures of what they can see. 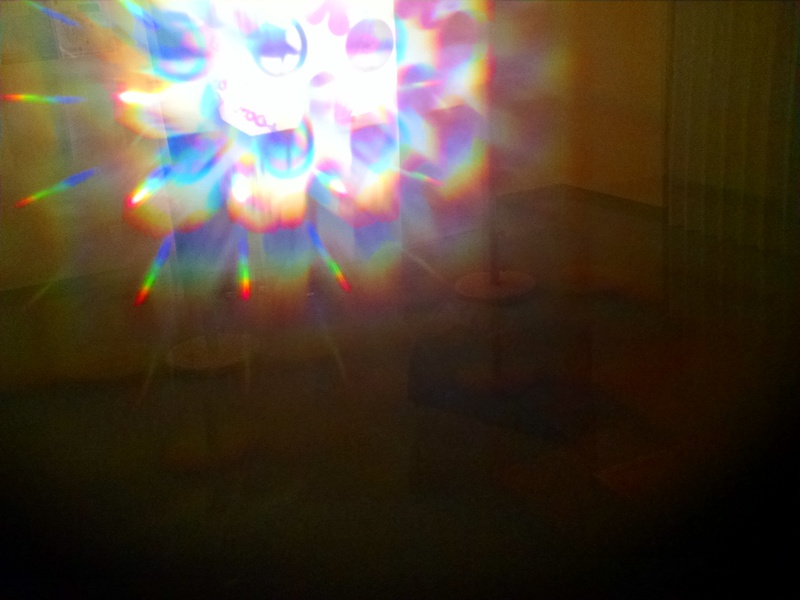 You’d need a camera with a small lens (like a cell phone) to line up with viewing holes on things like kaleidoscopes. 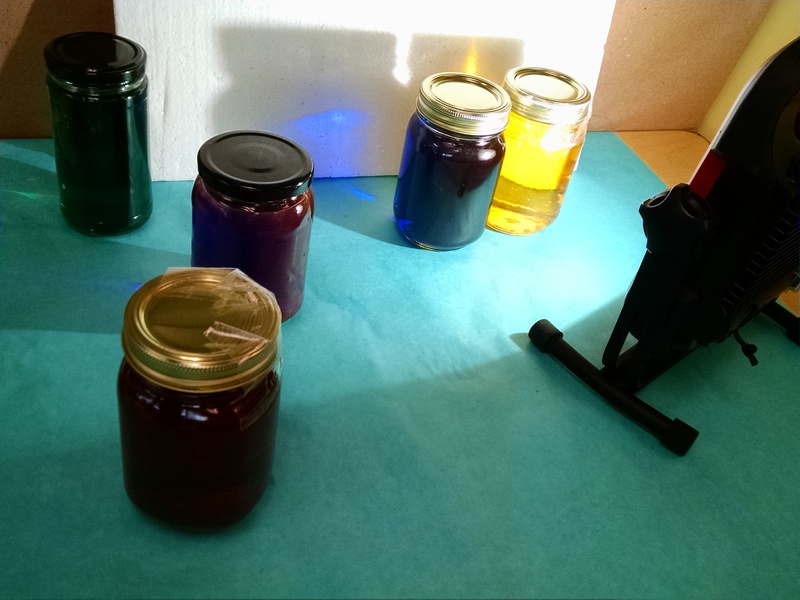 Color mixing light with water: We had jars of colored water and a bright light to shine through them. We used a mirror to reflect the light to “mix” colors. This experiment was not yet a success. We needed a flashlight with a really tight, bright beam, not a broad angle shop light, and we needed a darker space with less ambient light. Color Mixing Lightbulbs. I built this lightbox which uses colored LED bulbs and dimmer switches to mix light. Learn more here. Rainbow Tops. Last year, we tried Rainbow Button Spinners. We weren’t happy with the results – the kids could color the wheels, but the parents had to do all the assembly, and then they weren’t heavy enough to spin well. Might be good for 6 – 8 year olds, but not a good match for our 3 – 6 year olds. 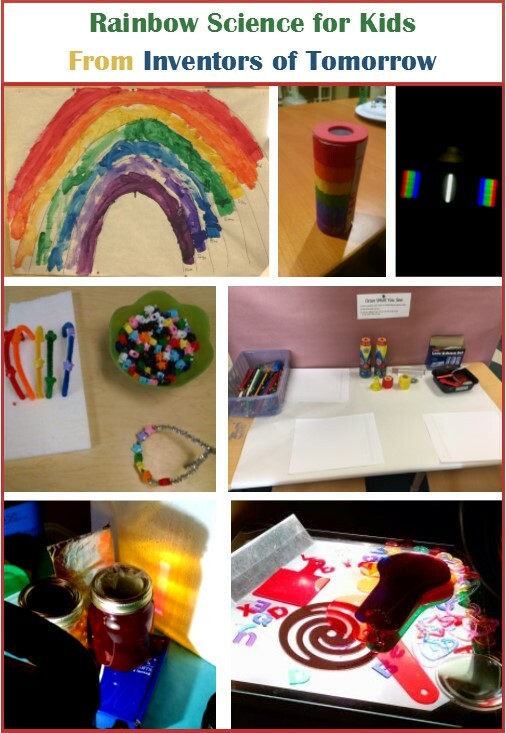 This year, we did tops – built a top with a metal washer and a dowel, then added the paper rainbow disk. When you spin it, the colors all blur together. Rainbow butterflies: We used eye droppers to drip liquid watercolor onto coffee filters, which creates some beautiful color mixing. (Don’t dilute the liquid watercolor – use it straight.) 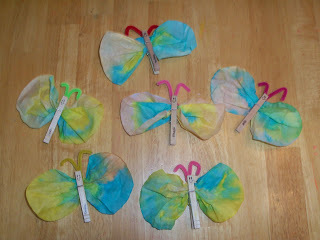 Then we used clothespins to turn the coffee filters into butterflies. (I like the old-fashioned clothespins a little better than the spring-loaded ones for this project.) Add googly eyes (or draw on eyes) and pipe cleaners to finish the project. Salt Painting. 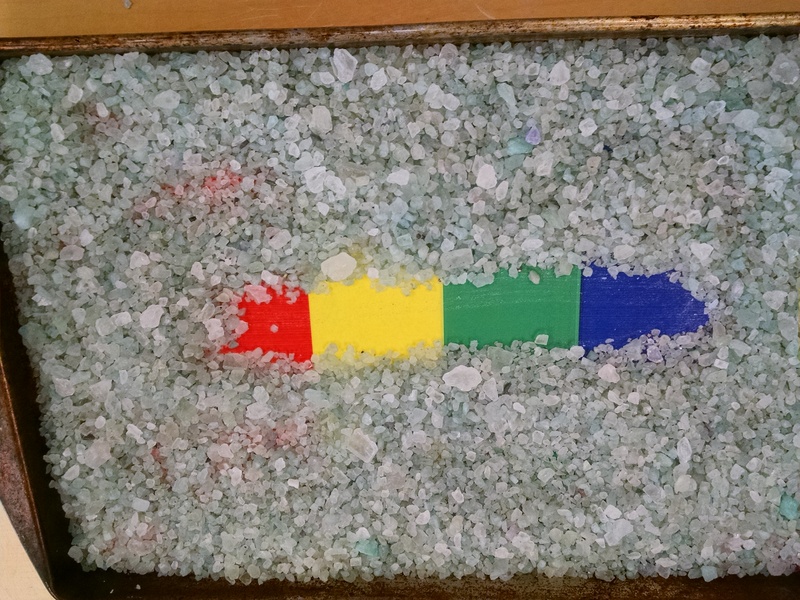 You can make colored salt and sprinkle it onto glue for a really pretty result. Learn how. 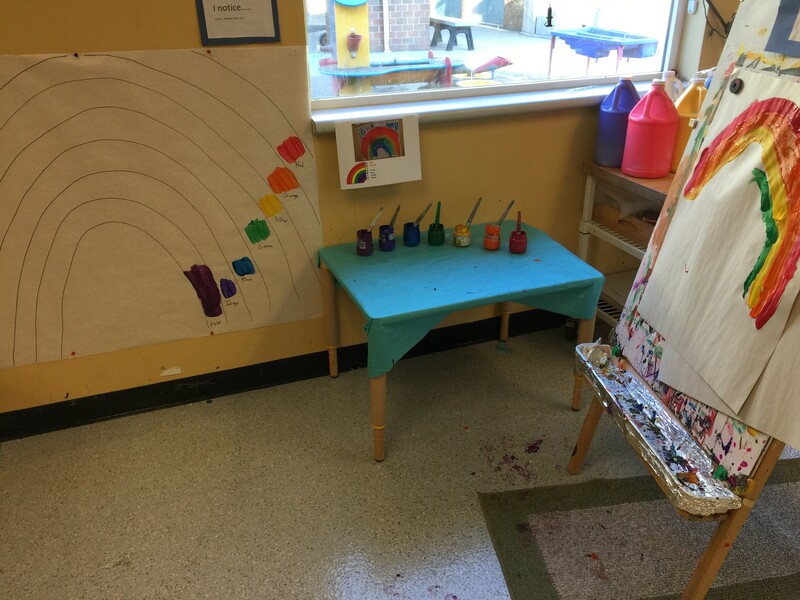 Group Mural: The first year, we had a painting of a rainbow on the wall, then had a black and white line drawing of a rainbow below that they painted in to match the one on the top. 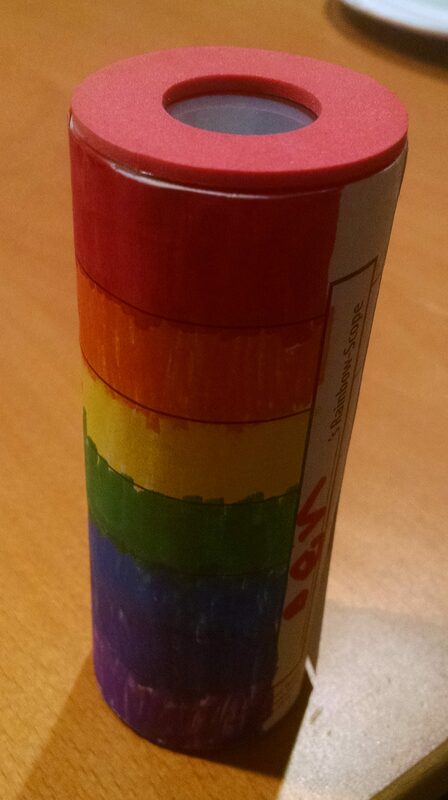 The second year, we offered a drawing of a rainbow and colorful post-it flags to fill it in. (Post-it flags are a good small motor skill builder. Buy them at a dollar store, don’t pay office supply prices!) It was easier to set-up and clean-up, but not as satisfying a project, so for the future we went back to painting, just drawing an outline of a rainbow and adding a color dot and a label onto each stripe so they knew the color to paint that stripe. We also had the easel next to it for anyone who wanted to paint their own rainbow to take home. Marbled Paper. After you do the shaving cream rainclouds described above, you can gently swirl the shaving cream around (be gentle – it will continue to float on the water if you do it right), then lay a piece of paper flat on top, press it down (slowly but firmly so it takes in the color but doesn’t sink under water). Then scrape the shaving cream off the paper, and you have marbled paper! Learn more about shaving cream paper marbling. Different types of nail polish yield different results – that’s Sally Hansen top coat on the left, and Sally Hansen hard as nails on the right. Color Mixing. You could take a clear container with lots of compartments (like a clear egg carton?) and give the children liquid watercolors and pipettes. 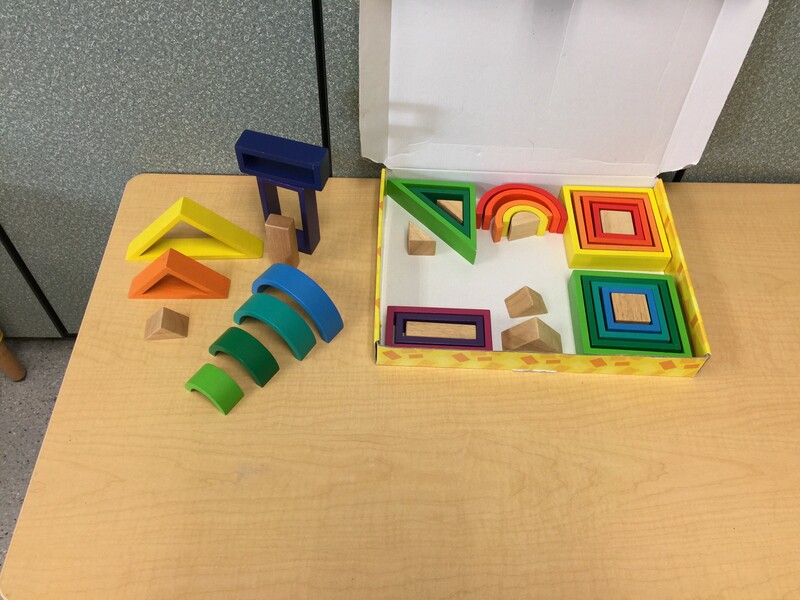 They can mix different colors in different compartments to see what they mix up into. 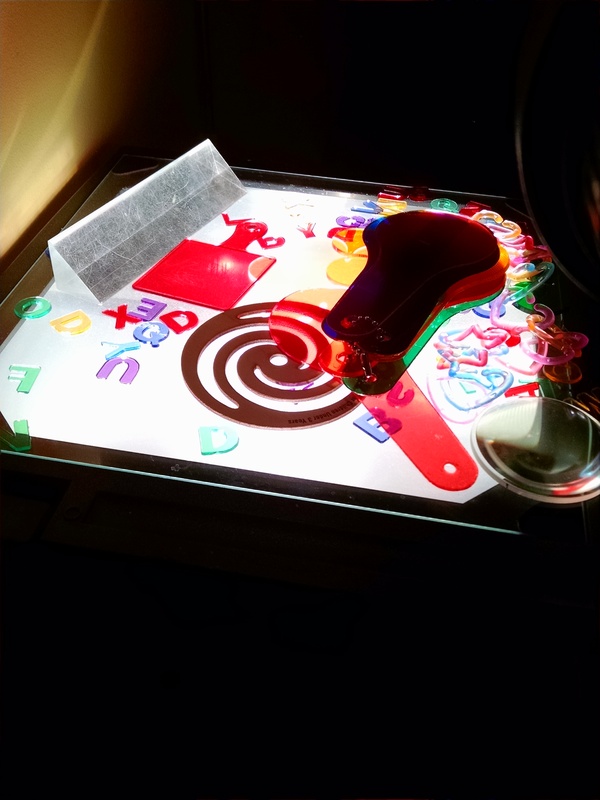 This would be fun on the light table. Shadow Screen. We had an overhead projector, so we set it up with our screen from last week’s Shadows class. We put out a wide variety of colorful items that could be set on the projector and seen up on the screen. 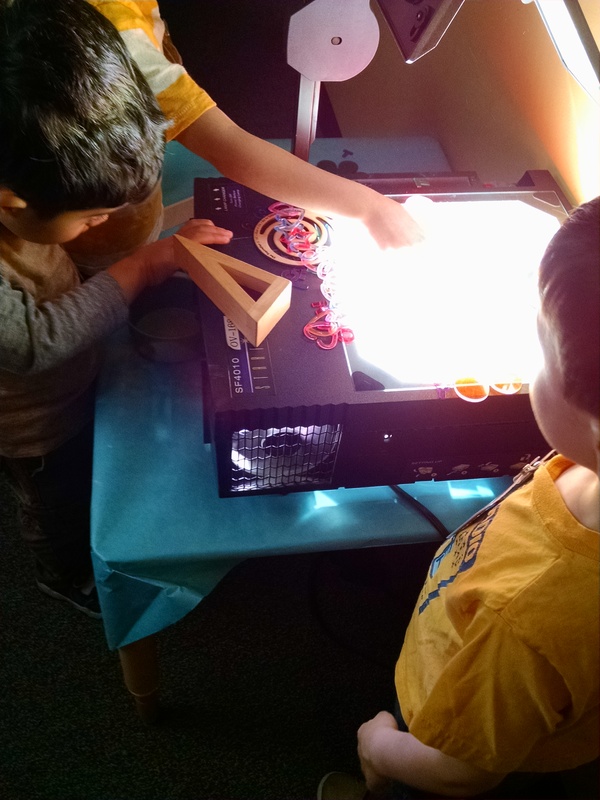 We also had a top that kids could spin on the projector and see the spinning shadow. This activity was a big hit. 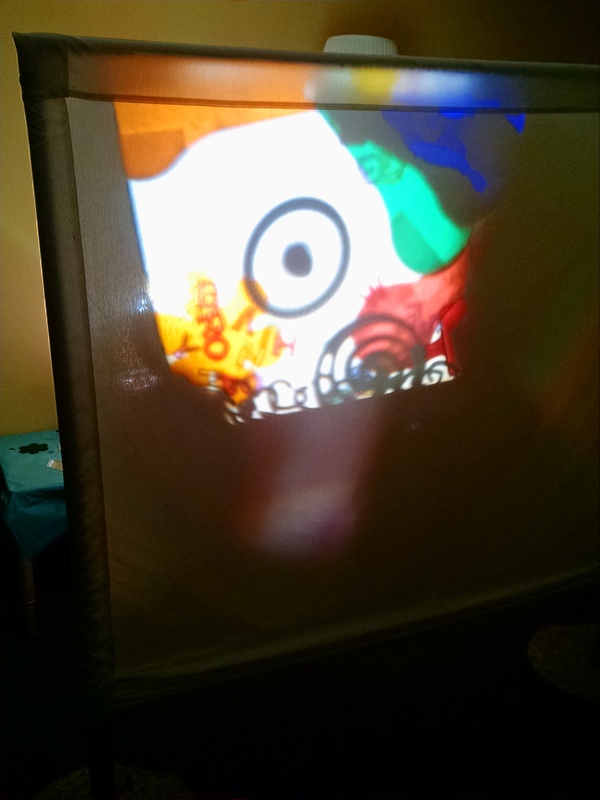 This projector idea was from a children’s museum we visited somewhere on our travels. They also had x-rays that kids could project on the wall, and these cool wood blocks with translucent shapes. Light Table. 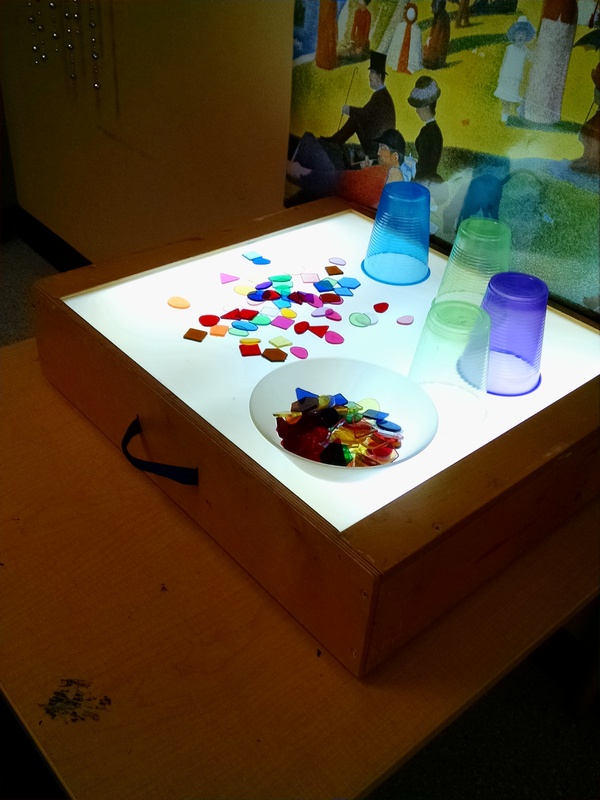 We put colorful translucent items on the light table. After I took the picture, we added Color Paddles which are fun for color mixing. 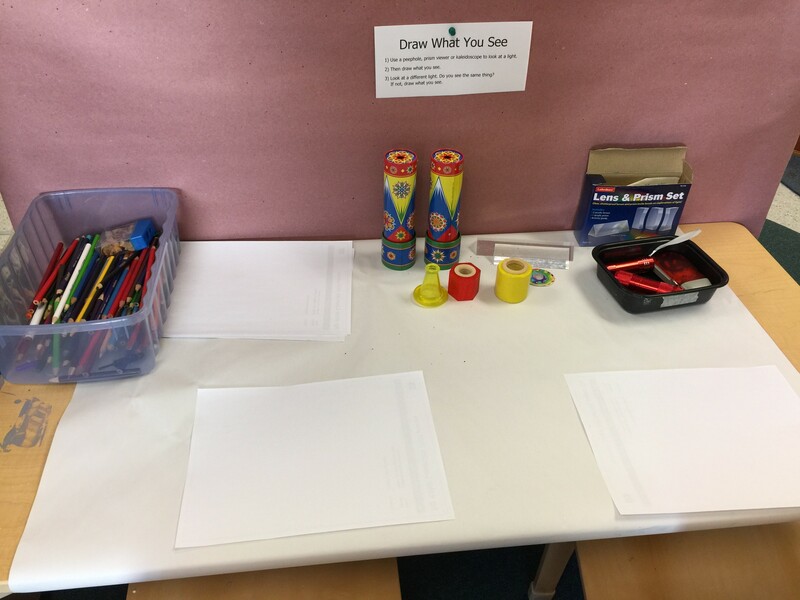 Writing tool: We made a rainbow tray, like in this Nurture store activity, with the intention of filling it with salt for kids to practice drawing letters in. But, we discovered we didn’t have salt in the classroom. We tried flour, which I’ve used successfully with one toddler but in the classroom setting with multiple kids, it was too messy. 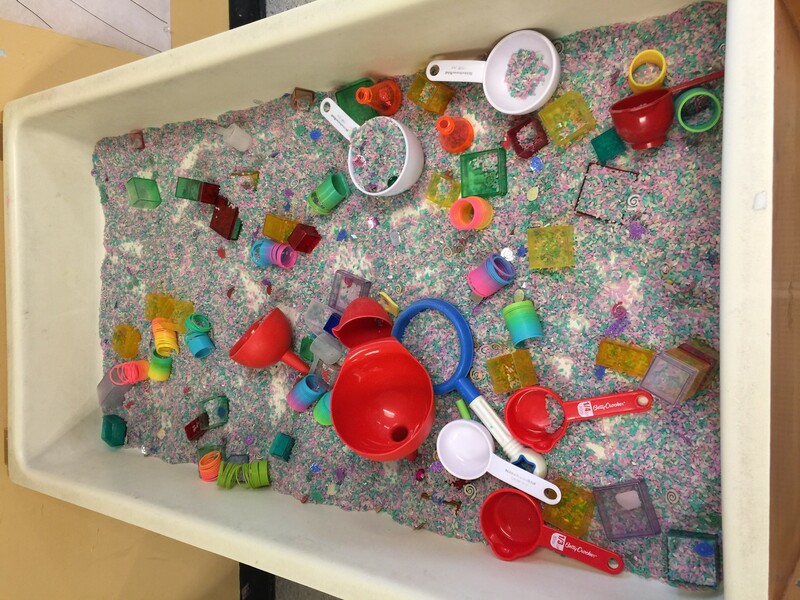 We tried white plastic beads (like you fill beanbags with) but they were too messy. We tried rock salt, but you couldn’t effectively trace letters in it. So, we’ll try again next time. Other Ideas: Other activities we’ve used for this theme were magna-tiles, rainbow crayons, rainbow colored blocks, rainbow puzzle stacker, a sensory table filled with colored rice or pasta or other colorful items, a water table filled with water beads of other colorful items, a rainbow water xylophone. We had blocks of ice that they could sprinkle salt onto and pour water onto, and drip liquid watercolor on to help it melt. Even better would be to make rainbow colored blocks of ice. We also had a rainbow colored tumbling mat with colored hoops to jump into for some big motor play. We played a little spontaneous Twister on the mats: Put your left hand on the red part, put your right foot on the blue part, and so on. There are so many songs about rainbows! I made a playlist of rainbow songs and we just had it playing in one room while kids played. Then I showed them the flashlight on my phone and asked what color the light was – white. I told them it was made of many colors, and if we could bend the light, we could see all those colors. Book: We read A Rainbow of My Own by Freeman. It’s a nice story of a boy who imagines having a rainbow follow him and play with him, but then his imaginary rainbow disappears. When he goes home, he finds a “rainbow of his own” in his room as the sunlight shines through the goldfish bowl, creating a rainbow. It’s a sweet story, and our kids totally got that real rainbows don’t behave like his pretend one did, and they liked that it ended with the rainbow and the goldfish bowl, which echoes the demonstration we just did. Oh, I like red, it’s the color of an apple. Orange, it’s the color of an orange. Yellow, it’s a lemon, and a wonderful sun, sun, sun. Green, is the color of the trees, and lots of things that grow. And then there’s blue for the sky, And purple, that’s a color that’s fun, fun, fun. And when we put those colors side by side, Now, what do you think we’ve done? We’ve made a rainbow, and it’s a really beautiful one, one, one. There’s some other nice song options on Preschool Express and on Perpetual Preschool, or on the YouTube playlist I mentioned earlier. Closing Circle: We sometimes read Planting a Rainbow by Ehlert, about planting a colorful garden. It ties in nicely to this week’s rainbow theme and an upcoming Seeds and Plants theme. Sometimes, on the color mixing theme, we read Mouse Paint. Rainbow by Bauer and Wallace. 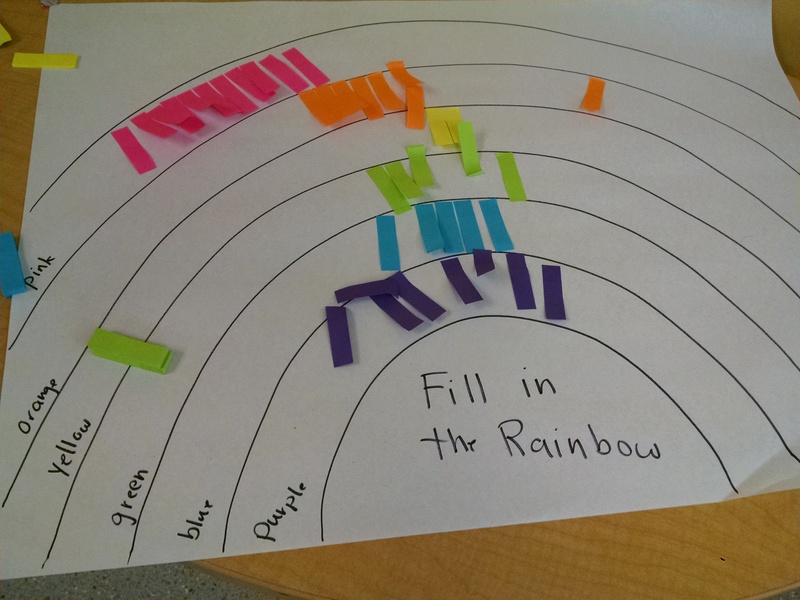 A simple non-fiction read-aloud that overviews the basic science of rainbows. 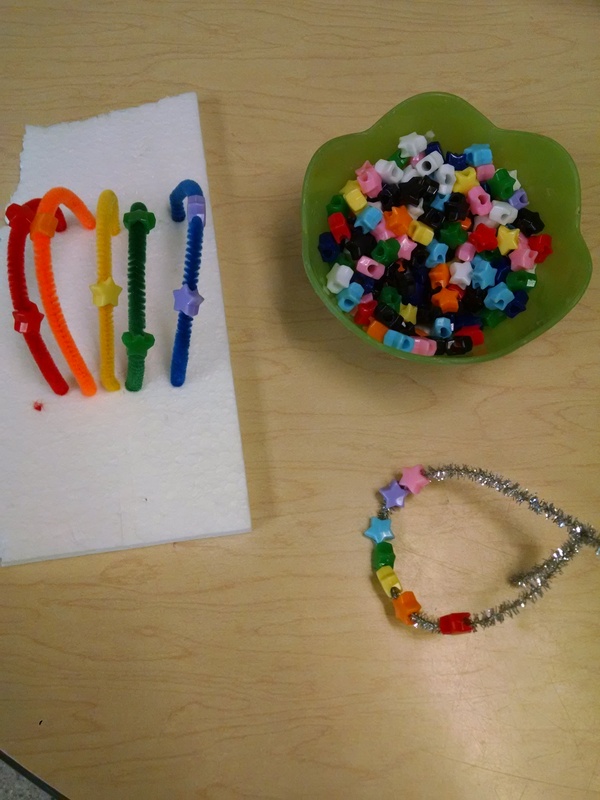 Good for a preschool STEM class. Take a Walk on a Rainbow – A First Look at Colors – a fine non-fiction book about science, rainbows and colors. I Am a Rainbow by Dolly Parton. A feelings book. Talks about when we’re tickled pink, seeing red, feeling blue, green with jealousy, scared yellow and when everything is rosy. Nice little book about emotions but my 5 year old wanted to know why it didn’t include orange if it’s called a rainbow book. Rainbows Never End: and other fun facts by DiSiena and Eliot. A science trivia book for ages 6 – 7. A couple pages on rainbows, and more on snow, rain cycle, thunder and lightning, tornadoes, solstice, the North and South pole, deserts. and so on. A good general purpose collection of “fun facts”. Rainbow Shoes by Stone and Czernecki. A collection of silly poems, each tied into a color. Do Robots wear red rubber boots? Orange socks. Purple pants poem, my underwear is dingy and so on. Fine for a poetry unit, not really for a STEM class. Elmer and the Rainbow by McKee. There’s a rainbow in the sky that has lost its colors. Elmer goes on a quest, and then shares his colors with the rainbow. I’m all for fantasy (see “A Rainbow of My Own” that was my favorite for this week) but this book managed to just be too scientifically inaccurate for my taste. Curious George Discovers the Rainbow adapted by Cherrix from a TV episode. Really wordy in the main text – maybe suited for 6 – 7 year olds, plus lots of wordy side bars of additional facts. The content is good – there’s just a lot of it. 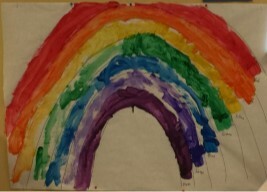 Maisy’s Rainbow Dream by Cousins. If you have a Maisy fan, they’ll love this book, which is full of lots of big, bright, colorful illustrations. I don’t love it. The page says something like “Maisy dreams about an orange fish.” And there’s a picture of an orange fish, but also a panda bear / mermaid and an alligator on an airplane, a squirrel in a boat and a ladybug. Who knows why. Ages 3 – 4. Rain Books. If you’re talking about rain as well as raindrops, here are some good options. Raindrops Roll by Sayre. Absolutely gorgeous nature photography combined with a nice read-aloud about rain for preschoolers. Lovely. Who Likes the Rain by Etta Kaner. Nice non-fiction. Videos: There’s a Sid the Science Kid episode called What is a Rainbow. It’s available to stream for a fee on Amazon, but I have not found a free version. Also, check out the links above in the opening circle section. Affiliate Links: In my posts, you’ll see lots of links to products on Amazon. I do get a “kickback” – a referral fee if you click through and buy these products. However, my primary goal is to make it easier for you to find the materials, or sometimes just to illustrate what I used. For example, in my post, I don’t want to spend a lot of time describing the best brand of shaving cream to buy at your local drugstore. It’s easier to put an affiliate link to the Barbasol on Amazon so you can see what I used, and you can know whether that’s something that’s easy / cheap for you to pick up at a local store.